The Wirth Park trails are pretty cool. Twisty turny singletrack with a few obstacles. It's not very hilly in there either so if you like hills, it's not for you. I'll probably stick mainly to the river bottoms since it's easier for me to get to. I approve of bike trails with their own tunnels. Big Rivers Trail, near the Mendota end of the Mendota Bridge. I have been biking a lot lately and went on a similar quest. The libarary has maps you can check out but they are from 2001. 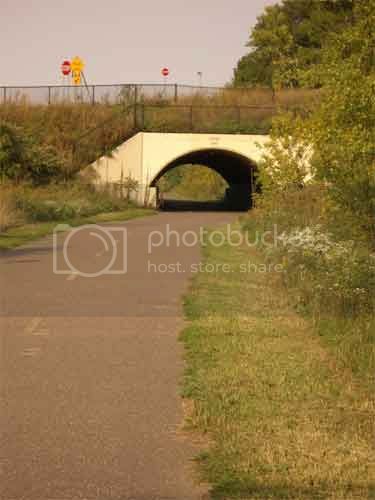 Hennepin County has a website with bike trails that has never worked when I tried to use it. I wound up riding over to the Hub Bike Co Op and buying a metro area bike map. It was pretty expensive (9$) but is very detailed and shows both mountain bike and commuter trails. I have actually discovered a lot of faster ways to get places I ride too a lot just from studying the map. I might have to pick up one of those maps. I just got my new ride today. If anyone can suggest to me some routes from Macalester area in St. Paul to downtown Minneapolis, that'd be sweet as I'm hoping to ride here and there when I don't take the bus. *edit* Actually, looks like I'd just take Summit to E. River Road to get to work. Awesome. My wonderful bike was stolen this month. I loved her so much. I named her Eunice. She was an ugly little huffy, and I spent more money on her at Geno's shop than anybody could ever see as worthwhile, but I still will forever miss her. Once I locked her up to the Triple Rock and got too drunk, forgot I'd ridden her there, and took a cab home. I had no idea where she was. Fortunately I drink a lot, and went back to the TR within a week and found her. I was in something like, 15 bike accidents with her. Where's a good place to get a crappy bike for cheap these days? My cave. I have one that'll make a decent city bike for $50. I have a little bit of work to do on it yet. Just picked it up last night. I also have a few others right now. The Elroy-Sparta bike trail has some nice long tunnels on it. It takes two days to get there by bike, but it's worth it. I'm kind of itching to qo on some longer bike tours again. Maybe next year. Germy: Can you find your way to the river from there? East river road to Franklin to riverside. Gotta picture of the new ride yet? I generally pick up a good frame and build it up with parts, every time I need a bike. Usually it runs me about $100-$200; although I've gotten carried away a few times with the modifications I was doing, and a couple of times, built bikes with several hundred dollars worth of parts! One of those, an extremely modified chrome Raleigh, was destroyed in the worst way, back in 2000, in a car accident that nearly killed me. It's almost not fair that I was allowed to live, and that beautiful riding machine was taken away from me. Even worse, the insurance company tried several times to lowball me for the replacement costs, because to their narrow way of thinking, a bike isn't recognized in those situations as a bona fide vehicle, despite the licensing, and the reams of receipts I had for the parts, which constitutes the opposite of depreciation, I should think. They see it as something purely recreational, and therefore of less value. Idiots. The bike I built up after I started riding again was a black Trek, which probably was worth about a grand in parts alone, and was only recently stolen. It must have been the BMX pedals that caught someone's eye. I haven't had a bike stolen in at least twenty years! Just my luck that on the way to work one day, the bike rack on the bus was already full, and I did not want to go late, so I locked it to a sign in downtown St. Paul. Of course, it wasn't there when I came back after work. The police in St. Paul could care less about something like a stolen bike, but at least there is a report on file, so if I get arrested while pummeling in the head of whoever I see riding it, they'll know why. My current work in progress is a purple Pollock-splattered Fuji frame someone abandoned after an accident of some sort, left on my girlfriend's boulevard. The frame was the only part of the bike that wasn't obliterated, strangely enough. It's slowly going through some nice modifications as well, although I'm starting to think I should have painted the frame first. I mean, that purple frame is really loud! Super-light, though! I haven't done any real winter bicycling since the accident, because I don't want to push my luck, after having had surgery a few times now. I miss winter riding most of all, though! I'll have to pick up one of those bike maps, too - I'm sure my regular commuting habits could be cut in half if I knew where more paths and trails are. This past summer, I've been keeping in shape by biking back and forth from my place in St. Paul to my girlfriend's place near Uptown Mpls. I can beat the buses for time, and I feel great after a good ride! Slightly out odf date, but not bad. Oh, for sure - once I remembered I can just take Summit to East River Road (which I've taken to the Triple Rock previously), I realized it'd be cake to get downtown. Tunnels are great for singin' your favorite Dub/Reggae songs. My current fave is Curly Locks. Tunnels are usually prime spots for spotting stoner graffiti. Germ War, what kinda bike did ya get? I got a single-speed On One "il pompino" frame with drop bars. I don't really know much about bike parts and whatnot, so it doesn't get much more specific than that. Probably much too nice of a bike to have in the city, especially after hearing everyone else's bad luck of late. I love it and am going to be heartbroken if it ever gets stolen. Took me 30 minutes to get to downtown Minneapolis from Macalester this morning. Definitely faster (obviously) than my BMX, but I'm still thinking I can improve on that time a bit.